Today is the 1 year birthday of Crayon Physics. The game was released 1st of June 2007. With everything that has happened it’s somewhat hard to believe it’s only been a year. 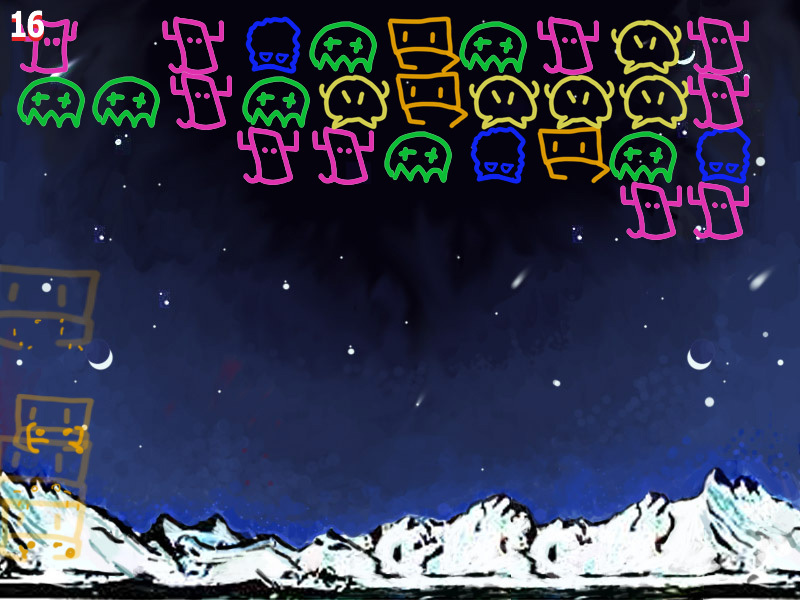 You have to save the planet from invading space invaders. 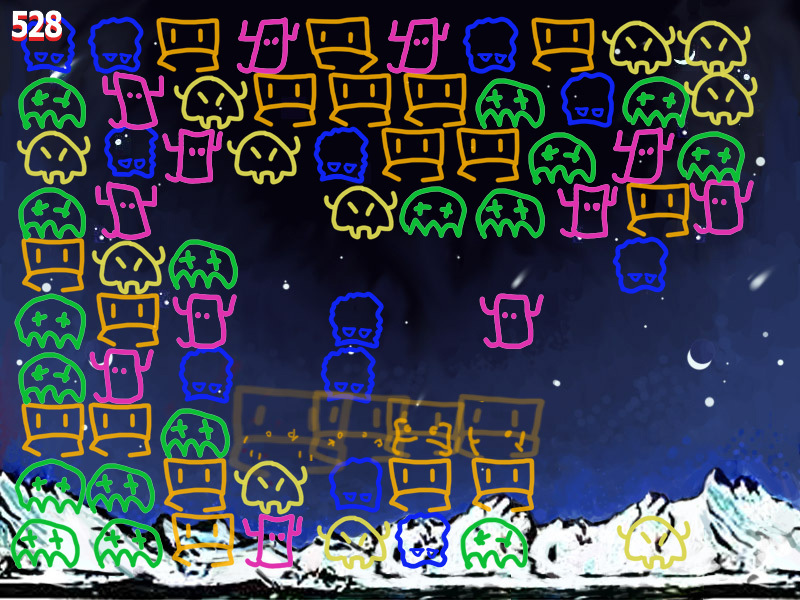 The space invaders have a weakness if they are stacked according to the match-3 rules they will die and disappear! Click space invaders to drop them. Try to stack them in piles (or lines) of three or more. If you have problems getting the game to run I’d suggest on installing the newest DirectX 9.0c drivers and making sure you have .Net Framework 2.0 installed. 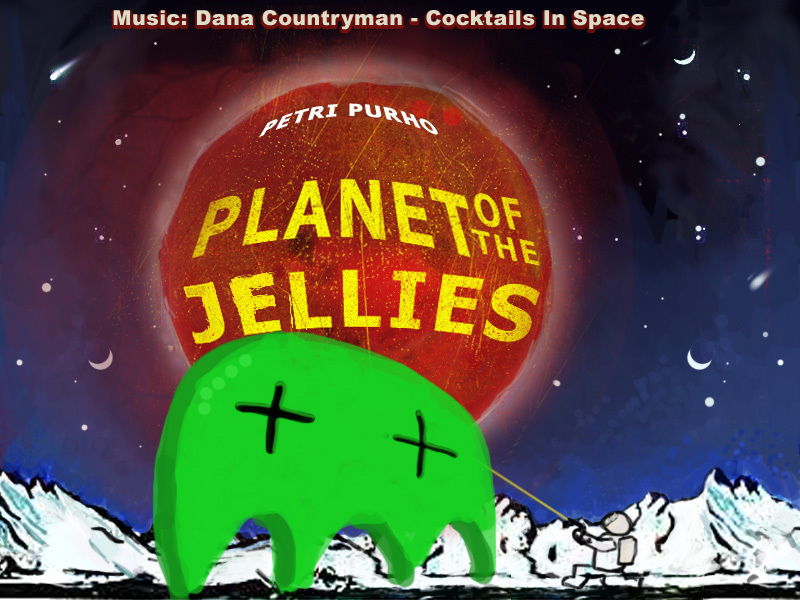 Music: Dana Countryman – Cocktails In Space. The song “Cocktails In Space” is freely available at http://www.comfortstand.com/catalog/001/index.html under the Creative Commons Attribution-NonCommercial 1.0 license. Sound Effects: bubble_hit_01.wav, bubble_hit_02.wav, bubble_hit_03.wav, bubble_hit_04.wav, bubble_hit_05.wav, bubble_hit_06.wav, bubble_hit_07.wav are from BUBBLES POPPING.wav by Hell’s Sound Guy. They are lisenced under the Creative Commons Sampling Plus 1.0 License. click_deny.wav is sampled from click 1 off click.wav by TicTacShutUp. Both are lisenced under the Creative Commons Sampling Plus 1.0 License. Thanks to Sami for lending his camera (even though I didn’t have enough time to use it). Planet of the Jellies uses: SDL and SDL_Mixer. You are currently browsing the Kloonigames weblog archives for June, 2008.